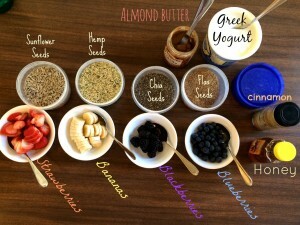 I just wanted to share my revolutionary breakfast that I adapted from Mike Dolce’s Breakfast ideas. I was looking for something that tasted great, gave me a tonne of energy without hunger pains, and was super healthy. This Breakfast packs such a punch that I could miss lunch without blinking (not that I recommend missing lunch, but to just illustrate a point of how it fills me up). It also takes great, and I use Amazon with Prime next day delivery as I can pick the best ingredients and have them delivered net day.I always go organic, as even though it costs more usually, I think that I am a great investment, and worth it! This particular breakfast I have been using for 2 months, and when I went on Holiday I really missed it! I also combine this with some amazing supplements to give me the ultimate morning. So what do YOU have for Breakfast? Comment below and lets get some other ideas for more perfect breakfasts.